If youve had a dog for a while, then you know Nylabone. Their pet products are synonymous with quality, affordability and selection. With millions of their products sold all over the world, it seems every dog out there has enjoyed chewing or eating one of their bones, toys or treats. Dogs just cant get enough of them! Whether its a collie, Sheppard, great dane, poodle, retriever, terrier, lap dog or mixed breed, they all love Nylabone. Nylabone dog chews and treats provide your dog the chewing satisfaction that he needs. We also carry Nylabones line of pet care products such as Pet Wipes, Dog Ear Wash, Dog Odor and Stain Removers and many others. If you are new to dog ownership, you should know that chewing is an expected part of every dogs life. Thats why our puppies love to chew our shoes, furniture, and anything else that happens to be in the way they love to do it. With the right chew toys and treats, you can save your home from destruction! So whats your dogs favorite flavor? Bacon, peanut, cheese, BBQ chicken or pork chop? Try them all and see what he or she likes. 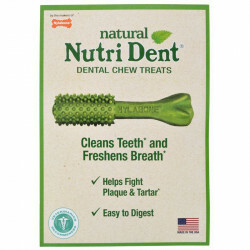 Available in a wide variety of assorted delicious flavors, Nylabone Nutri-Dent Dog Bones and Rawhide products are created to give your dog hours of chewing pleasure. We also have Healthy Edibles and other tasty Chews. Does your canine friend prefer people food to the hard crunchy dog food stuff? Your dog will love the natural food shapes of Nylabone Bar B Chew with almost real t-bone steak and corn on the cob shapes, chicken bone and Puppy Fish. We also have Nylabone Pure Joy pet toiletries including their Pet Wipes, Dog, Puppy and Pet Shampoo and Conditioner. We carry their dog ear wash and Dog Itch Relief products. The wash product is easy on your dogs ears and helps prevent ear wax build up. Other tasty goodies from Nylabone include their Beef, Pork, Roast Beef and Prime Rib flavored Dog Treats. Looking for something natural and organic? Get their healthy Vida treats. You will also find great Nylabone Nutri Dent Treat products like Prime Choice, Nutri Dent and Toro dog treats, right here on Pet Mountain. We have the best prices, the biggest selection and a super easy return process. What more could you want? 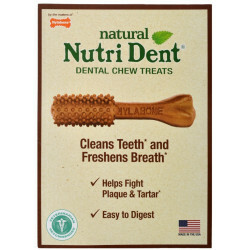 Ready to see all the great deals on Nylabone NutriDent chew toys, dog treats, supplements, wipes? Choose from our big selection. Youll find everything you need to keep your pet happy. Cant find something? Let us know; wed be happy to help. Be sure to check out our online coupons and discount shipping on all your favorite products.